Minstrel Banjo & Gibson Granada I traveled to the "big exposition of Banjo" (from July 31 to August 31) currently held in the Hamamatsu musical instrument museum. They are Banjo of an African root, old Banjo carried by black ship (the ship appointed the Japan-U.S. treaty of commerce), a gourd Banjo, Minstrel Banjo, etc. 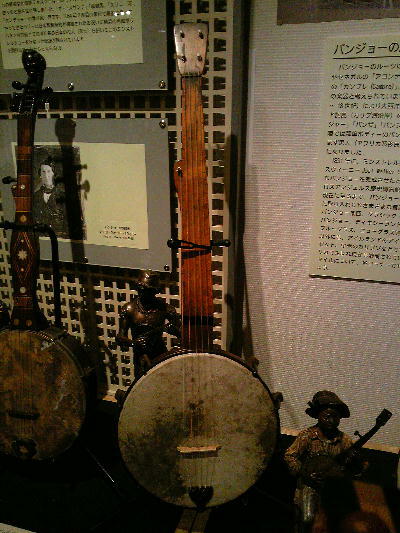 And there was also Banjo of a Japanese painting together with sculptural Banjo. 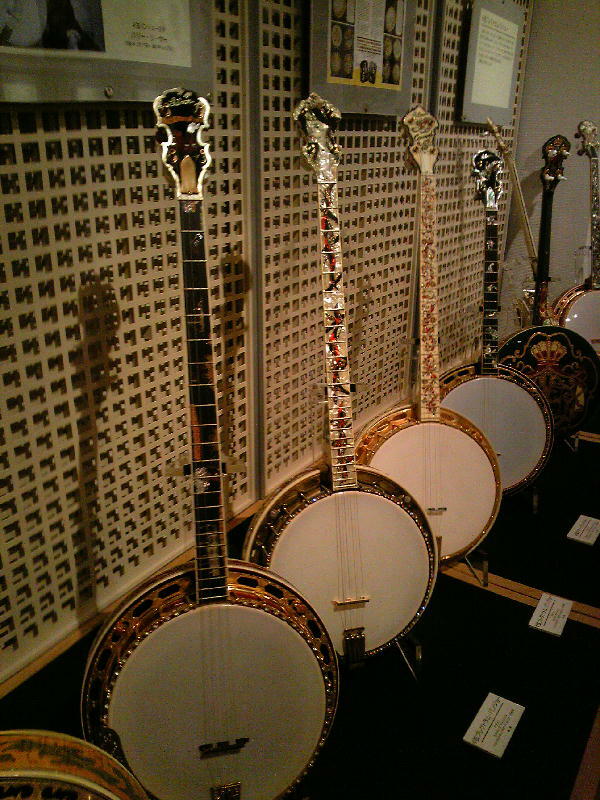 Of course, there is also introduction of BluegrassBanjo and the beautiful 4 strings Banjo of the famous TSUMURA collection was exhibited. 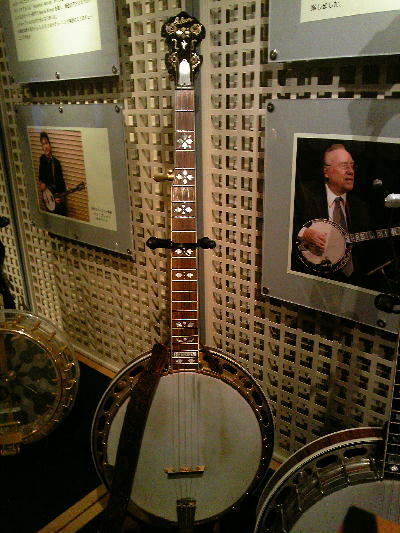 It is just large exhibition of the fullness of Banjo. It was an exposition which is worth making time and going. It will be a schedule of an event and a lecture concert on August 21 and the 22nd. The tenor conversion of Granada was also exhibited. Mr. Omori who is a famous Japanese Banjo player owned it. However, he passed away in the 2010 unexpected accident. Now, a dance circle is a boom and there are various organizations also in Nara Prefecture. The organization of a square dance has a practice meeting around us in Nara Prefecture. They dance by bluegrass music in a square dance in many cases. Several members of WIC are related to the organization of a square dance. Mr. kitchen is a fiddle player and superintends the "Nara Kentucky lounge." Of course, this is an organization of the square dance of Nara. Surprisingly, "Chi-chan" of the representation of WIC is a clog dancer. We think that a square dance is a folk dance. An image is the performance in Nashville IBMA in 2009. This is a demonstration of a United States champion called "Rocky top revue square dancers". This clog dance is deeply related also to irish or tap dance. It seems that they expressed the situation of BarnDance (dance in a barn). Music is "RickySkaggs&KentuckyThunder"! It is very hard bluegrass. I will ask a related WIC member about a square dance, a barn dance, and a clog dance later. By netsurfing We hit in the alcohol "Banjo" of Nara! This alcohol also sells on the Net with the product of the liquor maker "Nakatani Shuzou" of Nara Koriyama. It is expensive only at 500 ml. However, a fruity scent and a pure taste. I actually drank and it was fairly delicious alcohol. "Nakatani Shuzou" is the history from the Edo period. 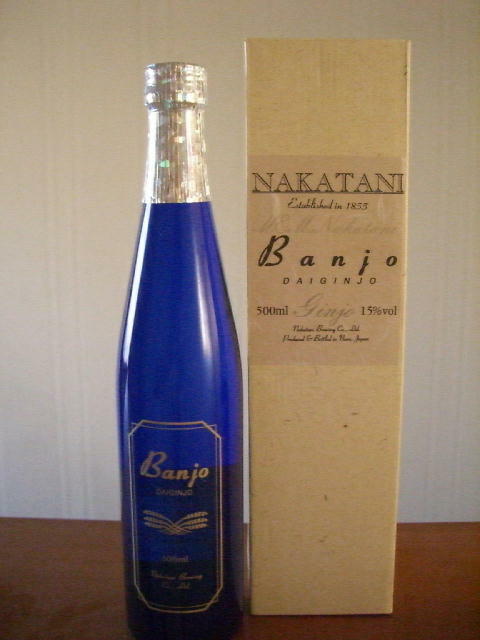 Because the address of "Nakatani Shuzou" was Banjo-cho, Yamato-Koriyama-shi that the name was set to "banjo." It was proved that it is bluegrass that any relation cannot be found. But I became glad and introduced!